When a brand makes a public apology, we are sure of one thing: the story that people are talking about makes the brand’s leadership uncomfortable. Whether it’s a gross error in judgement, negligence or corruption that is exposed, an apology is a clear sign that change is forthcoming. But in this fast paced world of instant, permanent and amplified communication, brand apologies have taken on a new form; a knee-jerk reaction to the slightest ruffled emotions, or actually part of the (terribly misguided) strategy. “Do it, and ask for forgiveness after” might be good wisdom for an innovative culture. And it’s a great tactic for breaking through red tape rules that get in the way of progress. Lately, though, it seems this mindset is also used as a lazy fall back when a sloppy attempt at awareness generates the wrong kind of attention. Brand leadership is about honouring your stakeholders—the employees, customers and communities that support your brand. As individuals, we align with brands that take a stand on issues and lifestyles. So it makes sense we’d rather see a brand accept that it might offend some people and not feign an apology after just to appease those who don’t understand or share the culture or sentiment in the first place. Show those that love your brand—and everything you stand for—that you are connected and understand them; that’s what deepens the brand relationship. A little controversy—a difference of taste, opinion or attitude—is at the root of a great brand strategy. But when something appears to go sideways, and those differences show up as very public rage, brand leaders need to anchor back to the core of the brand promise. If the action/message is inconsistent with your brand, you apologize and take action to change it. It’s good to apologize for true mistakes; errors that occur when systems break and products fail. There is tremendous value in being accountable to your stakeholders and honouring your side of the brand promise. However, if the action/message is consistent with your brand—perhaps just a little bolder than people are familiar, or more revealing to the uninformed—you’re likely apologizing to make amends with the wrong audience. Or worse, you’re apologizing because you really didn’t believe in your brand. When you apologize to the rage of those who were never aligned in the first place, you reveal weak positioning and undermine your entire brand strategy, and all your efforts outside of this one controversy come under scrutiny. You’re apologizing for being who you promised you were going to be, but only apologizing because it got a little uncomfortable. 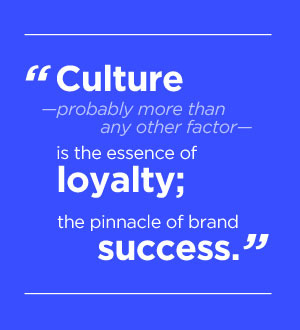 Brand strength is about honouring your attitude and culture. It’s about being proud of your values and how they manifest in the world. That’s authenticity showing up and adding value when it matters. That is brand strategy.